A. C. Brunk, Dhamtari, India, 1964. Aldine Carpenter "A. C." Brunk was born 25 October 1886 in Broadway, Virginia. He was one of five children born to John and Lilly Carpenter Brunk. He received his formal education from Goshen College, where he graduated from the academy in 1908 and received a B. A. degree in 1912. During his years at Goshen College he was challenged to offer himself for foreign missions and was appointed by the Mennonite Board of Missions and Charities (MC) in 1912 to serve in India. In 1913 he married Eva Harder, who was also serving in the mission. In 1921 he earned an M. A. degree from the College of Missions, Indianapolis, Indiana. 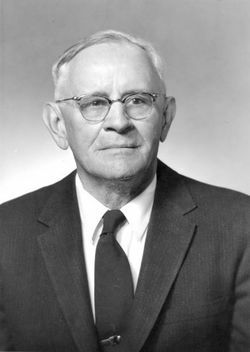 Though not an eloquent speaker, A. C. Brunk was an effective evangelist and able administrator. In India he served in many leadership roles. He was manager of the Balodgahan village, opened the Dondi station, engaged in extensive village evangelism, and served as field secretary, pastor, and superintendent of Shantipur Leprosy Home and Hospital. Aldine and Eva retired from mission service in 1947 and lived in Elkhart, Indiana, until Eva's death in 1949. Then Aldine moved to Colorado Springs, Colorado, where he helped organize the Beth-El Mennonite congregation. In Colorado he married Eva's sister, Melva Harder, and they moved to Hesston, Kansas for their final retirement years. He died 23 December 1969. Building on the Rock. Scottdale, PA: Mennonite Publishing House, 1926: 183. Gospel Herald (30 February 1970): 111; (23 October 1951): 1017-18. Friesen, John A. "Brunk, Aldine Carpenter (1886-1969)." Global Anabaptist Mennonite Encyclopedia Online. 1986. Web. 23 Apr 2019. http://gameo.org/index.php?title=Brunk,_Aldine_Carpenter_(1886-1969)&oldid=143261. Friesen, John A. (1986). Brunk, Aldine Carpenter (1886-1969). Global Anabaptist Mennonite Encyclopedia Online. Retrieved 23 April 2019, from http://gameo.org/index.php?title=Brunk,_Aldine_Carpenter_(1886-1969)&oldid=143261.